Four years ago, if you told someone that the quarterback-less FD Friars would come back after losing to GW in the championship in 2014 and would win the next season, they would hardly believe you. If you said that it would be a sophomore to fill in the role of quarterback, they would laugh at you. If you told them that FD would go 30-0 under this quarterback, they would completely dismiss you. Ironically, all of these events came into fruition as a part of the eventful career of FD star quarterback, Daniel Phillips. Daniel Phillips has gone from the IIAAG’s winningest quarterback to a fresh Outlaws team in the GFVL while still in high school. The Father Duenas Friars football team have been arguably one of the most dominant programs in the last three years. With so many players contributing to the success of the Friars’ football program over the years, one has consistently played an influential role in their offensive dominance, Daniel Phillips. Phillips has had to shoulder the pressure of leading the Friar offense for all three of the Friars’ consecutive undefeated championship seasons. After hanging up his gear with the final whistle in the championship game of his senior year (while getting his jersey retired by the school), Phillips once again suited up, but, this time, wearing a different jersey, and playing in a different league. 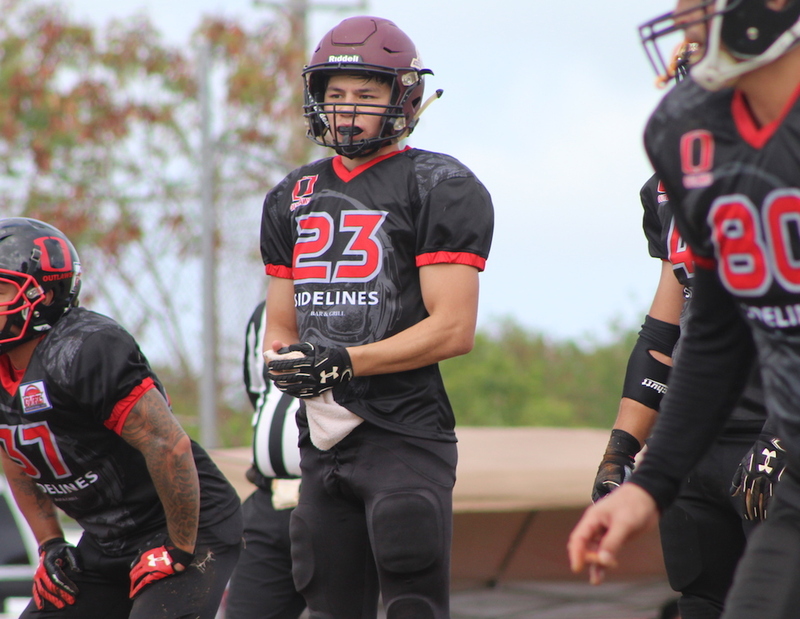 Daniel is now the starting quarterback for the Outlaws in the Guam Varsity Football League (GVFL) only months after claiming his third IIAAG championship and only months away from graduating high school. It’s a challenge that few choose to take on, but playing in men’s league is a task that Phillips embraces completely. “It’s definitely a new level of leadership. In high school, you’re playing with guys who are at the most three years younger or older than you. Leading guys who are much older, some double your age, it’s definitely more important to go out there and prove that you’re a leader, most especially with your performance, and that’s something that I really strive to do,” said Phillips on playing in men’s league while still being in high school. It’s on rare occasion that a high school player will participate in the men’s league because of the aura of intimidation that surrounds the league and the size differences that exist. Although size factors in a huge difference from high school to men’s league, football is still football for Phillips. “You’re still making the same reads, doing the same plays, going through the same motions. The only difference is how fast-paced it is and the size difference between the players in high school and the players in men’s league,” said Phillips on the similarities and differences between high school football and men’s football. He is considered by many to be a boy playing amongst men. Other than having the same coach from high school in Bruce Meno, Phillips has had to adjust to playing with a whole new team and playing with a new set of offensive weapons. But he understands that respect is earned in men’s league, not given. The men’s football league on Guam is notorious for the level of animation that the players exert when playing. One might see a strong display of emotion following a big play that will lead to very articulative banter between players of opposing teams. One could assume that the opponents that encounter Phillips on the opposite side of the ball tend to put a larger target on his back than they would for other quarterbacks considering his being in high school still. However, Phillips understands that the emotion is generated by a mutual love of the game. “During the game, they might try to rattle me a little bit and maybe hit me a little harder than the rest of the guys. I usually try to ignore it because after the game it’s usually respect for a high school kid playing in a men’s league, and I’m very thankful for that,” said Phillips when asked about how his opponents react to playing against a high school player. Outlaws teammate Justin ‘The Shocker’ Cruz has high praise for Phillips and believes his squad is ready to take their game to the next level. One of Guam’s most veteran football players in Raiders Sandy Fejeran was well aware of Daniel’s big-game ability and had nothing but respect for the young QB after squeezing out a close victory over Phillips and the Outlaws. “Hats off to that kid [Phillips]. I have a lot of respect for him and he’s not even 18 yet. I have a lot of respect for people who come out and play like that,” said Fejeran on the Raiders most recent showdown with Phillips and the Outlaws. The young Phillips may not be dominating like he did in high school, but he’s earning respect amongst veteran players after every game. Phillips’s collegiate ambitions are more aimed towards academics as he plans to attend University of Nevada Las Vegas to major in accounting. However, he leaves behind one of the most impressive legacies by any quarterback in high school football on Guam. In his sophomore year, Phillips was forced to assume the pressure of leading a team who was considered doubtful after losing not only the championship the previous year, but as well as the starting and backup quarterbacks. Not only was he able to win the starting spot over an upperclassmen affiliate player, but he was also able to win every game of that season and lead the Friars to their first championship in eight years and was named second team All-Island quarterback. His junior year was one that aimed for validation. Phillips aimed to dispel any doubt that he was an elite offensive weapon, and it would be safe to say that he was able to do that. Phillips was on a roll, and with each stellar performance, he picked up even more momentum. However, he would eventually be sacked by an opponent that he didn’t see coming that would put Phillip’s football career in jeopardy. Phillips was succeeded by senior back-up quarterback, Marco Jacob, who would go on to lead the Friars in the playoffs to secure the second consecutive undefeated championship season. However, while the Friars celebrated, Phillips was getting checked up on in UCLA hospital. To the fortune of Phillips, his family, and the Friars football team, the lump was found to not be severe. Despite the near-death experience, Phillips returned to his team, determined to cap off his high school football career with a third championship. He and the Friars were able to do just that as they broke the IIAAG Football record for consecutive wins (30). He ended the season just shy of breaking 1,000 passing yards, but barely saw playing time in the second half for a majority of the games in the season with the Friars putting the game out of reach by halftime. He received 1st team All-Island quarterback, was named MVP of the Triple J All-Star Game, and had the honor to have had his jersey retired by the Friars football program along with teammate De’Aundre Cruz. Now, five months after claiming his title, Phillips returned to Eagles Field, the very field where he not only had practice football for the Friars, but where he also learned how to play the game of football, playing for the Eagles in the youth league. From not winning a single game in youth football to pioneering the longest winning streak in Guam high school football history, Phillips has etched is name in Guam Football history. He has now embarked into a new league, wearing a new uniform, playing the same game on that very same field.